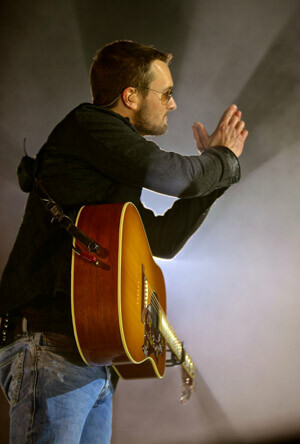 After a stomach bug knocked out most of his band and crew in Salt Lake City, UT on Saturday, Jan. 31, Eric Church took the stage at the EnergySolutions Arena for a 19-song acoustic set. As a consolation, Church announced he will return to play Memorial Day (Mon., May 25) with a full band. Supporting acts will be announced at a later date. Fans wishing to attend should hold onto all physical tickets. Those unable to attend that show can seek a full refund at point of purchase beginning Wednesday, Feb. 4, until 5 p.m. day of concert. Lzzy Hale‘s rock band, Halestorm, opened the show with a full 45-minute set. The production and stage were scaled back–only four spotlights and a minimal floor lighting package showcased Church in this unique setting. Guitar players Jeff Hyde, Jeff Cease and Driver Williams joined Church for a few songs and Hale came onstage for an acoustic rendition of “That’s Damn Rock and Roll.” Church worked six mic positions (scaled back from the normal 14), still performing to every section of the 360-degree setup. Fans looking to experience Church live can tune-in to CBS on Feb. 8 for the Grammy Awards, where he is up for Best Country Album and Best Country Song, and will play a yet-to-be-announced song. The Outsiders World Tour will return to the road on Wednesday, Feb. 4, at Sleep Train Arena in Sacramento, California.